LONDON -- Police in Northern Ireland said Sunday they suspect Irish Republican Army dissidents were behind a car bombing outside a courthouse in the city of Londonderry. Two men in their 20s have been arrested. The device was placed inside a hijacked delivery vehicle and exploded Saturday night as police, who had received a warning, were evacuating the area. There were no reports of injuries. 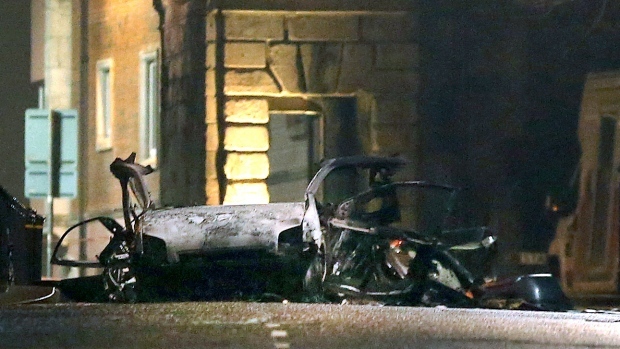 The Police Service of Northern Ireland posted a photograph of a vehicle in flames and urged the public to stay away. Police and army bomb-disposal experts remained at the scene on Sunday. Assistant Chief Constable Mark Hamilton said the bomb had been a "crude" and unstable device, and called the attack "incredibly reckless." "The people responsible for this attack have shown no regard for the community or local businesses," he said. Hamilton said the "main line of inquiry" was that the bomb had been planted by a group known as the New IRA. John Boyle, who is mayor of the city also known as Derry, said violence "is the past and it has to stay in the past."